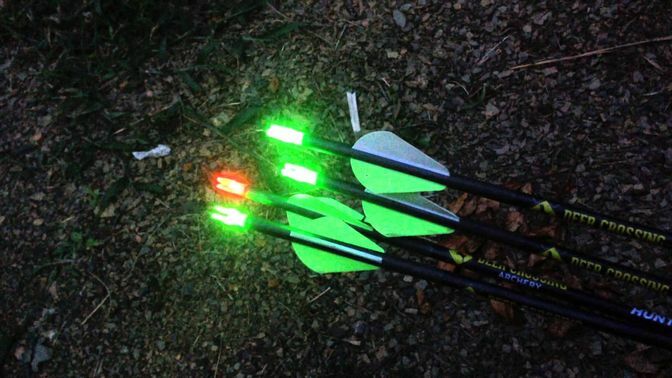 Lighted nocks for arrows are great hunting tools for locating your arrows when they hit a target. Aren’t they? But not all lighted nocks can get the job done as most of them are plagued with a lot of drawbacks and deformities. You might probably wondering: "what is the best lighted nock that archers shooting out there?" Golden Rule #3: What is the Color of the nock? What's the Bottom Line ? After a careful research, and a series of tests, we have reviewed the best lighted arrow nocks currently on the market. Take a look at each of them and see which one fits your hunting activities and needs. If you are looking for a Lighted Nocks that won't change your flight and still give you an accurate shot on target, then the Nocturnal-x is exactly the right fit for you. One of its amazing features is the internal linear switch that allows for easy “on.” Thanks to the super bright LEDs that let you see and trace your target even in daylight conditions. The light gives you a clear view of where your arrow is located even from a very long distance at night. Once you ‘on’ the light, it is going to stay that way for 24 hours. The battery life of this Nockturnal speaks for itself. Of course, it can last you for up to 24 hours, even when the light is constantly turned on. Apart from this, we highly recommend this product for experienced and beginner archers who are looking for a top of the line lighted nock that will make their hunting experience a breeze. Be sure to check producer's size chart for your arrows. The concentric design of the Carbon Express is not only brilliant but also helps to position the nook in the arrow shaft to give you consistent performance. The Express LAUNCHPAD did a superb job regarding accuracy and precision. It flies so much like darts without any issues for as long as 62 yards. Isn't that amazing? However, just like every other product, it does come with its own drawbacks. First, the only way to pull it off is to pull the nook out of the shaft and then pull it to the end of the nook. What ultimately tipped us over this nock are the three red LEDs that can last for 40 hours to give you a clear view to trace your target and retrieve your arrow. Unfortunately, this lighted nock seems to be more complicated, far larger than other nocks on this list. Well, the reason for this is due to the large dose of material and moving parts that was packed into their build and construction, making it a heavier nock. Has a slight chance of turning off after hitting an object. No doubt, Clean-Shot Out Lighted Nocks offer a lightweight nock with a beautiful design coupled with a bright nock light for a better view. Most of the time, hunting is best at dawn, and it may be a bit difficult to observe if your arrow has hit its mark or not. Due to the heat of the moment, it could be a little tedious to remember the precise location of the target. This information is necessary to track down the animal or leave it till it's worn out. A right lighted bow nock would ensure you can easily see where you struck your mark with ease and also provide you with the capacity to see the extent of penetration made by your arrow. Finding an arrow would help you determine if you hit your mark correctly or not. But sometimes this could be a very daunting task especially if your arrow gets lodged in the dark areas of the wood. When t﻿﻿﻿﻿racking an animal in the dark or during the day, light up arrow nocks can assist you in locating your illuminated arrow. Asides from knowing the location you hit your game, it is also crucial that you know the exact location it is headed. Although most hunters utilize the blood trails left by the wounded animal to keep track, the animal may sometimes vanish into the woods especially when it is dark. A good lighted nock helps in correcting that as it helps you pinpoint your game with the light it illuminates. This would ensure you hardly ever lose track of your mark. This is another great benefit of a good lighted nock. It can assist you in singling out issues ﻿﻿﻿with your bow before you take it out to hunt game. By taking a few shots off your arrow beforehand at the range, you would be able to observe if any of your arrows are inaccurate and your bow requires tuning due to the faint light it emits. 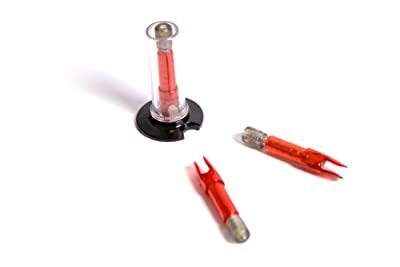 In most of the illuminated nock sold on the market today, the batteries they come with cannot be replaced. They are produced to be utilized and changed when the battery runs out. Although there are a few designs that come with replaceable batteries, it is a bit tedious to locate the batteries. You also want to consider the battery life. A lighted nock with a battery that can't last through the day would not be an excellent choice for you. 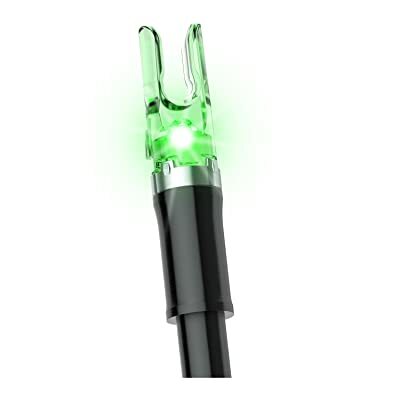 We recommend you choose lighted nocks that have at least 24 hours battery. Before choosing a nock, ensure you pick one that keeps the weight in front of the center of the arrow for the best accuracy. 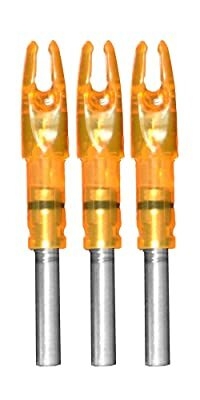 You also have to consider the fact that you may need to replace or upgrade areas of your arrows when you utilize lighted nocks that place the total balance in check. Not putting this into consideration may leave you with a lighted nock that has reduced accuracy. A blue, red or green LED which uses a clear nock is a better alternative as they are quite easy to locate in the dark or during the day. It is also best when it contrasts the environment and most times. Although, green or red is one of the most popular colors, a combination of them both or two other different colors would perform well as the best lighted nock colors. When choosing a nock, make sure it is legal in all the locations you may want to hunt. The regulations pertaining to hunting vary by hunting clubs, counties and most importantly by season or state. If there’s one thing you shouldn’t joke with when shopping for a lighted nock is to always consider the ease to “on and off” the nock. Unfortunately, the light of so many nocks are pretty difficult to turn off, which often drains the battery life. If you want your battery to last you for a long time, then you want to consider how easy it is to “on and off” the nock. The truth is most of the lighted nocks out there are very complex and complicated to assemble. To worsen it, most of them provide you with instruction manuals that are difficult to comprehend. So, before you hit the buy button, make sure you find out if the product is easy to setup and if they offer an easy-to-read instruction manual. 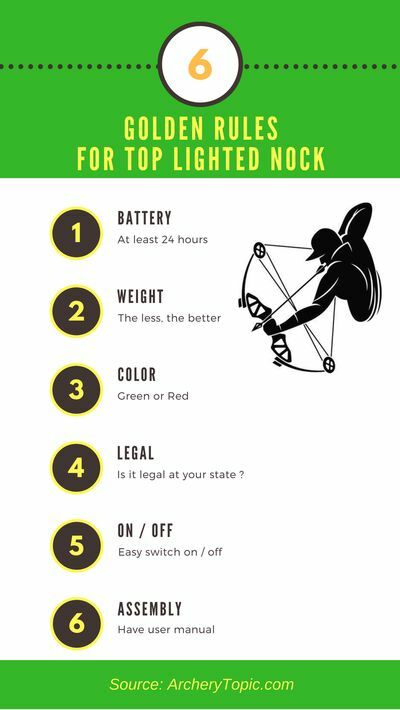 In a nutshell, if you are just starting out or you are a professional bow hunter who is looking for a reliable lighted nock that will get the job done, then the Nockturnal-X Lighted Nocks is exactly the right fit for you. Sharing is caring. If you have any opinion, don't hestitate to leave your comments below. Thanks.